Interop is one of the premier IT trade fairs with a history going back more than 25 years. 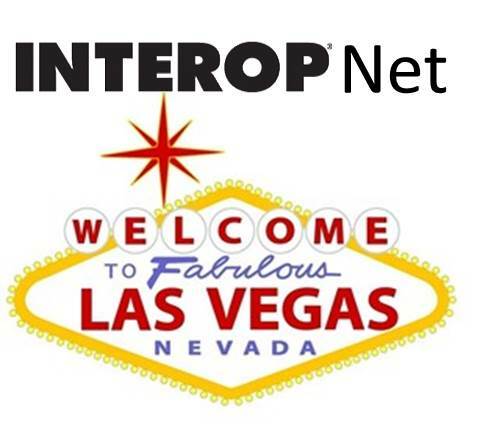 There are three scheduled events this year (Las Vegas, London, Tokyo), which makes Interop a meeting with a global footprint and a finger on the pulse of IT developments around the world. During the past few years, the main focus has been on networking and cloud computing. This is reflected by the exhibitors and attendees. I am pretty sure that most of you are familiar with Interop and have perhaps attended in person. What you might not know is that for the Las Vegas and New York meetings, the network that supports more than 300 exhibitors and 10,000 attendees, InteropNet, is built from scratch year after year! Some might think, “Why the hassle, and why not use the venue’s network?” However, you can’t find many other opportunities with such a high density of network engineers and IT professionals that a) would be willing to volunteer to design, build, and tear down such a network, and b) would appreciate such a feat. It’s remarkable that dozens of network engineers volunteer to work many hours to put together a wired and wireless network that is needed for three days only. The reason volunteers participate year after year in InteropNet is because they get to play with the latest and shiniest equipment donated by the InteropNet vendor providers, and they also get to go through the process of designing and building a network the best way possible without any legacy infrastructure or poor past design choices holding them back. It’s like setting a child loose in Legoland. In preparation for InteropNet, all volunteers and providers meet for ten days during Hot Stage. This is when all the magic happens. People with different backgrounds, ages, experiences, and skillsets go through an intense ten-day design-and-implement exercise, starting on a blank slate. The end result is the network that will support the next Interop, together with all necessary monitoring tools needed to support the event. The same volunteers and providers set everything up a few days before the event, support, and maintain the network during the event, and disassemble everything afterwards.